This is probably not the most interesting archaeological site you will visit in your life but it is worth checking out if you're in the city. For one thing, it is more than 2,500 years old and was built in the Iron Age by the Ammonite Kingdom, and later it was used by the Romans. It is basically around 18 feet tall and in its heyday must have had at least two or three floors. It is thought that this was a watchtower used as fortification against enemies. Another possible use of the tower was a storage to keep harvested produce to protect it against nomads. Since there is nothing much else to do here, take your photographs and move on. How popular is Rujm Al Malfouf? People normally club together King Abdullah Mosque and Jordan National Gallery Of Fine Arts while planning their visit to Rujm Al Malfouf. Rujm Al-Malfouf is one of a series of watchtowers from the Ammonite kingdom in modern day Amman, Jordan. Its name can be directly translated as the Twisted Stone, which derives from its circular shape. Built in the first half of the first millennium BCE, the watchtower is located on Jabal Amman. 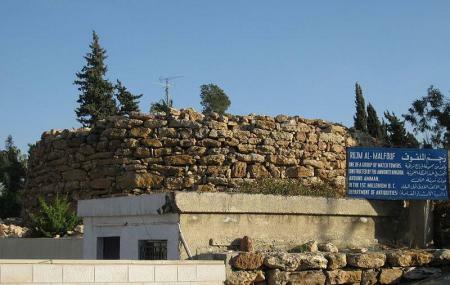 Rujm Al-Malfouf is next to the Jordanian Ministry of Antiquities.